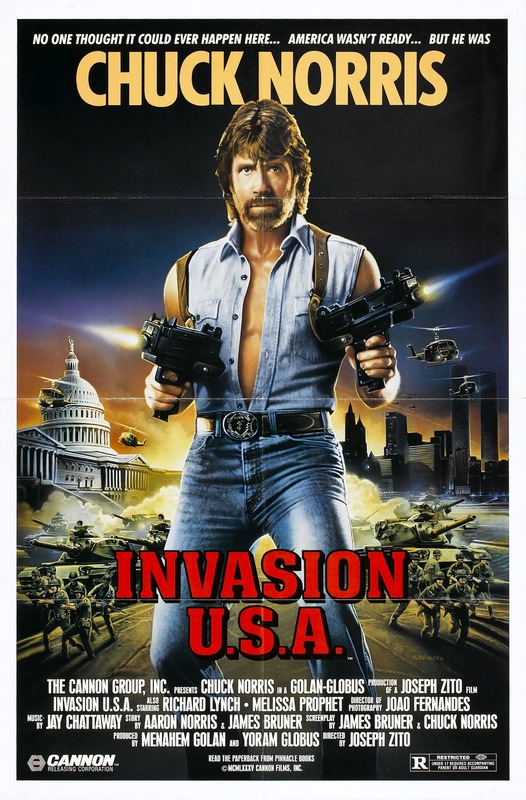 Released in 1985 Invasion U.S.A. is a film that could have only been made in the 80s and by the Cannon Group. After a somewhat slow start Invasion U.S.A. becomes insanely violent and over the top with non-stop action scenes with a body count that according to some goes into the 100s though a lot are off screen. In 1984 Joseph Zito directed Missing in Action for the Cannon Group, which of course starred Chuck Norris and this was Zito’s 2nd film with Cannon and Norris and while not a bad film it isn’t nearly as enjoyable as Missing in Action. In my opinion Invasion U.S.A. is a middle of the road film as it has its strengths, but also has too many flaws to keep the film as anything more than average. As I mentioned the first half is a bit slow and at times I was losing interest and despite the action in the 2nd half it doesn’t really make up for it (well it does to some degree). Russian terrorists invade the Untied States and set out to destroy it and their plan seems to be working. That is until former agent Matt Hunter (Norris) gets involved. The screenplay was written by James Bruner & Chuck Norris and Bruner has written or co-written such Norris films as Eye for an Eye, Missing in Action, Delta Force & Braddock: Missing in Action III. The screenplay by Bruner & Norris suffers from a weak plot where character motivations lack and the characters lack depth and just aren’t that interesting. The first half of the film while a little bit of action is mixed in, it focuses more on the characters and they just weren’t strong enough to carry the film at all, which is unfortunate since Invasion U.S.A. does feature a solid cast. The basic idea to the film is a little similar to Red Dawn, which was released the year before in 1984. However it very much lacks the depth of that film and tries to make up for with action, but its just too subpar until we finally get to the action. If the characters were just a bit stronger the script would have worked a lot better (or if the film was cut from 107-minutes to roughly 90-minutes or so). One issue of many I have with the script and while it might sound silly, but it sort of annoyed me is when the police unaware Hunter is a former agent and arrest him for killing terrorists since as they say nobody is above the law. If terrorists were to invade the US and cause the damage they do in this film I highly doubt the cops would be concerned with a civilian killing terrorists. In the case of a vigilante like say Charles Bronson in the Death Wish films, he in real life would be arrested and charges would be filed unless the prosecution felt they couldn’t get a conviction, but if terrorists invaded the US I highly doubt the cops would target someone killing them unless they were targeting innocent people as well. I think the police would have much larger concerns. Invasion U.S.A. was directed by Joseph Zito who first made a name for himself in 1981 with the slasher film the Prowler, which has been noted for the gore F/X by Tom Savini, and due to the Prowler, Zito would get hired to work on Friday the 13th: The Final Chapter, which by many is considered the best of the series and film would re-team Zito and Savini (they would work together two more times with this film and Red Scorpion). As mentioned Zito would work with Norris twice and than in 1988 with Red Scorpion, Zito wouldn’t make another film until 2000 with Delta Force One: The Lost Patrol and than 2003, Zito would direct Power Play and would be his final film. When it comes to Joseph Zito for the most part I’ve enjoyed his work and while not a great filmmaker he does know what his audience wants and more or less delivers the goods. The Prowler is actually one of my favorite slasher films and while sure Savini’s F/X are nothing short of amazing, Zito also crafted an eerie film. The only issue I’ve had with Zito’s work is at times the pace can be a little sluggish, which has more to do with editing rather than direction. Invasion U.S.A. isn’t an exception. The first half of the film is quite sluggish in spots only saved by a couple of action scenes. As mentioned at 107-minutes, Invasion U.S.A. is a bit overly long and would have been better served within the 90-95-minute range. However with that said once the action finally does kick in Zito doesn’t disappoint. Terrorists target a random neighborhood and blow up a few houses in a scene that’s quite insane. Than later they target a mall and shoot it up and set off explosives. Really the only problem is the film can be a bit boring until we get to those scenes and while they are exciting sequences, but for me by the time we got to them I’d lost some interest and it slightly took away the fun the action scenes were. Despite the issues of the first half the 2nd half is pretty much non-stop action and they’re quite fun and exciting again only brought down for me by a sluggish first half where by the time the action kicked in the film did lose me a bit. Invasion U.S.A. does feature a solid cast, which does make things a little frustrating since it could have been so much more. Billy Drago a terrific movie villain only has a brief role and if you cast someone like Billy Drago you really should utilize them more. Richard Lynch was a terrific character actor and he always made a great villain, but the only problem here is Lynch’s character lacks so much depth he really isn’t able to showcase his skills. Chuck Norris is his usual self the no-nonsense tough guy who doesn’t say a whole lot. The biggest knock I’ve read about Norris isn’t he doesn’t have a lot of onscreen charisma, which to some degree is true I suppose (though that’s not the case in films like Missing in Action), but I actually think that works in his favor to be honest. It’s tough to explain, but maybe it makes his characters feel more real if anything. While my review isn’t exactly glowing I still enjoyed the film for the most part and its just the first half that hindered the film for me. Believe it or not it wasn’t until I got the DVD that I saw the film from start to finish as in past viewings I saw the entire film in a couple of airings. To be honest it worked better that way since when I caught the 2nd half it made things even more exciting. I always sort of lost interest right before the action kicked in so when I caught the middle on it wasn’t bogged down. However I’d still recommend this to fans of both Norris and the Cannon Group. If you can just stay invested with the slow first half it does sort of make up for it in the 2nd half. Joao Fernandes would serve as the director of photography on Invasion U.S.A. and he first served that role in Zito’s debut film Abduction and would be Zito’s DP on all his films except his last two features. Fernandes would also DP a number of Chuck Norris projects as besides the two Zito/Norris films, Fernandes would also DP such Chuck Norris films as Braddock: Missing in Action III, Delta Force 2, the Hitman, Sidekicks and would also work on the Chuck Norris show Walker: Texas Ranger. Lastly, Invasion U.S.A. was scored by Jay Chattaway who worked on such William Lustig films as Maniac and Maniac Cop to name a couple of their collaborations and Chattaway also has worked with Joseph Zito on Missing in Action, Red Scorpion and Delta Force One: The Lost Patrol.